Academy for Public Speaking = Success! In addition to gaining confidence, effective communications skills, and leadership experience, Academy for Public Speaking graduates have won over $23,000 in scholarships and cash prizes from competing in speech contests. Competing in speech contests is one of the most effective ways for your child to improve his or her public speaking skills. You can give your child an advantage by having his or her script professionally reviewed, scheduling private coaching sessions, and enrolling him or her in our speech contests course. For more details, please click here. Alexander Won a $4,500 Scholarship! 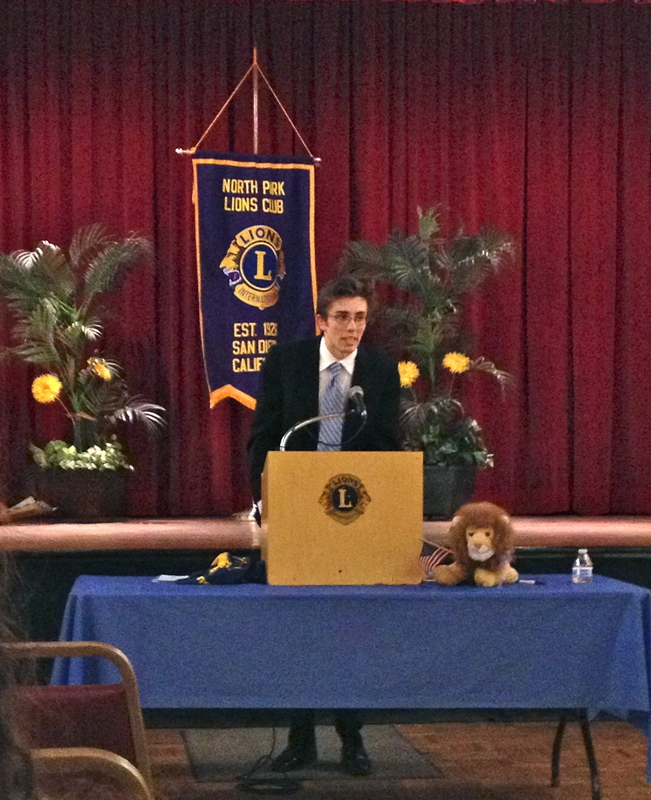 Academy for Public Speaking coaching client Alexander Danilowicz competed in the 4th level of the Lions Club Student Speakers Contest on April 12, 2014. This is a highly competitive speech contest for students in 9th-12th grade. Alexander won 1st place and a $4,500 scholarship. Alexander will advance to the 5th level of the Lions contest, the state semi-finals, on May 10, 2014 in Whittier, California. Alexander will compete to win a $6,500 scholarship. The top prize for winning 1st place in the state finals is a $10,000 scholarship. Best of luck, Alexander! 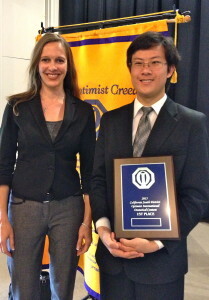 Academy for Public Speaking graduate and coaching client Hanrui Zhang won 1st place and a $2,500 scholarship in the 2014 San Diego District Optimist Club Oratorical Contest. The contest was held on Saturday, May 3, 2014 at Grossmont College. 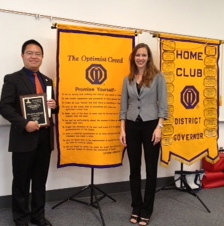 Hanrui represented the Del Mar Solana Beach Optimist Club. 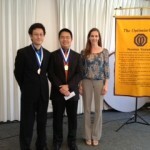 Hanrui was the guest of honor and he shared his award winning speech during the Optimist Club’s meeting at the Loma Santa Fe Country Club on May 21, 2014. 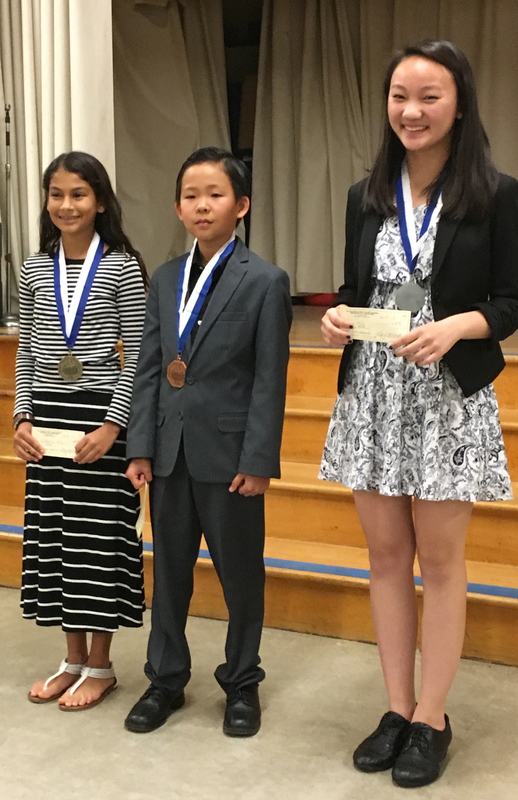 Congratulations to Academy for Public Speaking graduate and coaching client Austin Zhang for winning first place and a $2,500 scholarship in the 2015 San Diego District Optimist Club Oratorical Contest! Austin competed in all three levels of this speech contest. 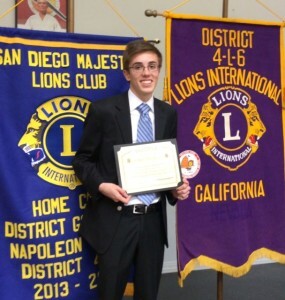 First, Austin won the Del Mar Solana Beach Optimist Club Oratorical Contest in March. Next, he advanced to the North County Optimist Zone Oratorical Contest in April. 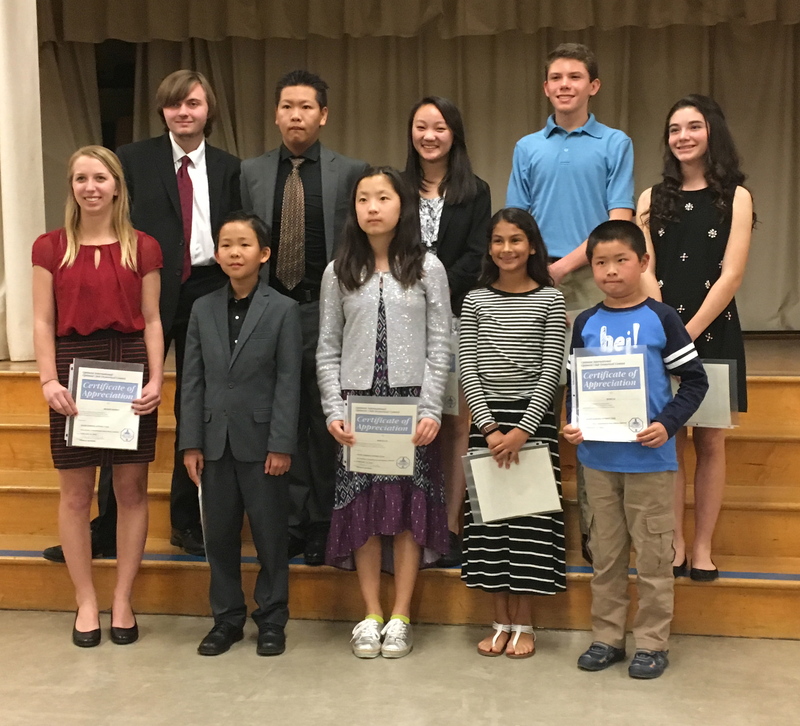 Six Academy for Public Speaking graduates competed in the 2016 Allied Gardens Optimist Club Oratorical Contest in San Diego on February 10, 2016. The speech contestants showcased their optimism, influence, and public speaking skills as they presented 4-5 minute speeches on the topic How My Best Brings Out the Best in Others. Academy for Public Speaking graduates performed exceptionally well and won all of the awards for the second year in a row. Congratulations to Natasha Bacorn for winning 1st place and a $100 cash prize, Jocelyn Tzeng for winning 2nd place and a $50 prize, and Ethan Song for winning 3rd place and a $25 prize! We are very proud of you for your achievements! 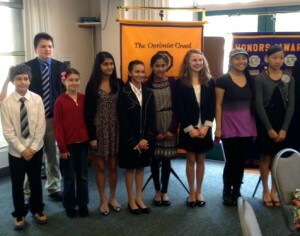 In the Optimist Club Oratorical Contest, students from all grade levels compete against one another. Therefore, we are especially proud of Natasha and Ethan for competing against high school students and outperforming them! We are also extremely proud of Kevin Liu for competing in his first speech contest outside of the Academy for Public Speaking and not being intimidated by competing against middle school and high school students! 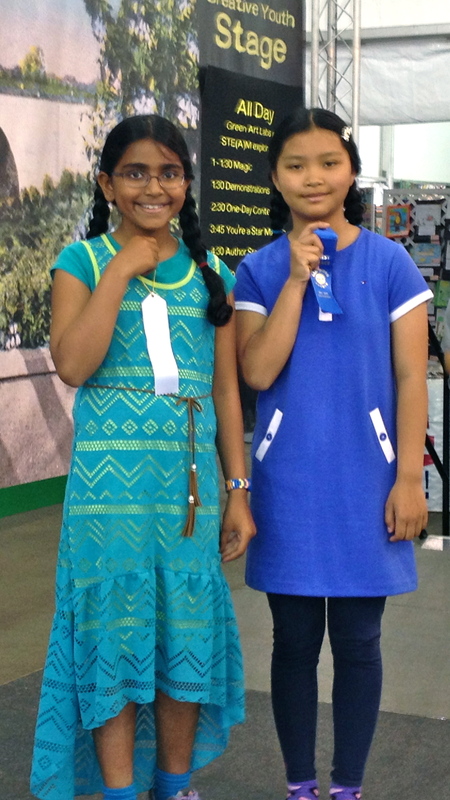 Natasha and Jocelyn will advance to the 2nd level of the speech competition, the zone contest, on April 16, 2016. Although the 2016 Lions Club Student Speakers Contest has just begun, Academy for Public Speaking graduates have already won 1st place and $650 in 4 Lions Clubs contests in San Diego. The topic this year is “Liberty and Justice for All” – What Does It Mean to You? The winners from the club level contests will advance to the zone level contests next. Good luck, Academy graduates! 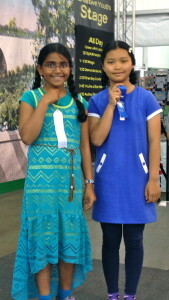 Speakers competed in the three different grade level divisions – K-5th, 6th-8th, and 9th-12th. In the elementary division, Academy for Public Speaking graduates Ethan Song and Connie Jiang both won 1st place and $300 each. Ethan’s award winning speech was entitled “The Great Wall Of China.” Although Ethan had just completed 3rd grade, he is already an extremely talented public speaker. In addition to his natural talent and completion of the level one course with the Academy for Public Speaking, Ethan has also benefited from weekly coaching sessions with his public speaking coach Kathleen Petrone. Connie Jiang shared her entertaining speech entitled “My Trip to Yellowstone.” Connie has developed her level of confidence and public speaking skills by participating in the Academy for Public Speaking level one and advanced courses twice with different groups of students and the masters level course once… so far. Connie plans to enroll in the masters course a second time in the spring of 2016. 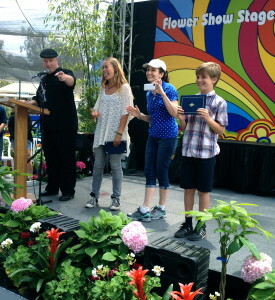 Connie has also improved her public speaking skills by taking advantage of opportunities to be a special guest speaker at a variety of community events such as the San Diego Kids Expo, the SteamMaker Festival, and for free introduction to public speaking classes for new students who are interested in the Academy for Public Speaking. Connie has also worked with public speaking coach Kathleen Petrone. As a third grade student, Amrutha Challa shared her award winning speech “Wonders of the World.” Amrutha won 3rd place and $150. Although Amrutha is very young, she is also a talented public speaker. Amrutha is a graduate of the Academy for Public Speaking level one and advanced courses. 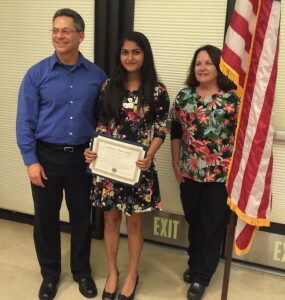 Academy for Public Speaking level one graduate Aisiri Murulidhar competed in the Serra Mesa Lions Club Contest. Aisiri won 1st place and a $75 cash prize. Academy for Public Speaking advanced graduate Solana Garcia competed in the Oceanside Lions Club Contest. Solana won 1st place and a $75. 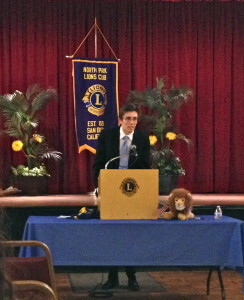 Coaching client Alexander Danilowicz competed in the North Park Lions Club Contest. Alexander won 1st place and a $75. 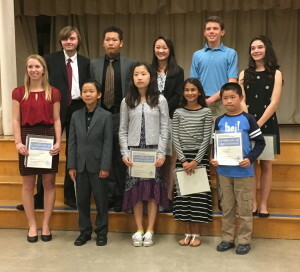 Academy for Public Speaking masters level graduate Hanrui Zhang competed in the Encinitas Lions Club Student Speakers Contest. Hanrui also won 1st place and a $75 cash prize. Miles Blue won 3rd place! We are extremely proud so many of our graduates decided to compete in the oratorical contest. 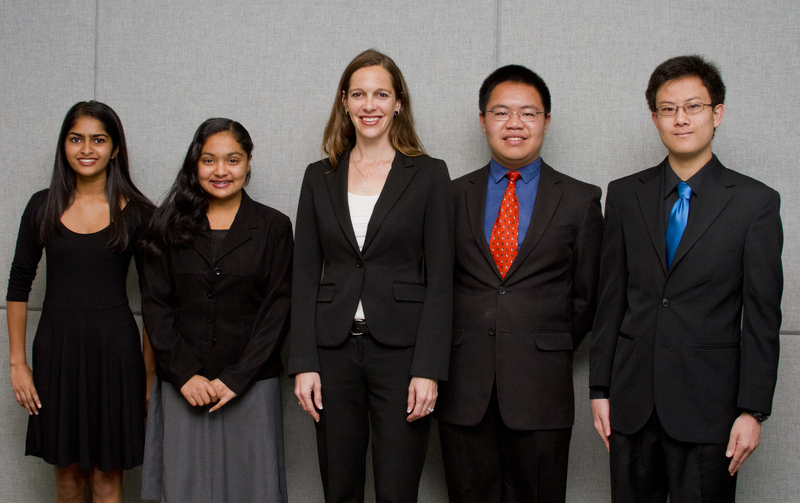 For thirteen of the Academy for Public Speaking students, this was their first speech contest ever! 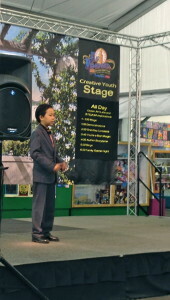 The San Diego County Fair Oratorical Contest has three age divisions; K-5th, 6th-8th and 9th-12th. Prizes are awarded in each age division for 1st, 2nd and 3rd place. The 1st place winners each receive $300, the 2nd place winners each receive $225 and the 3rd place winners each receive $150. Austin Zhang won 2nd place! Academy for Public Speaking students have competed in the San Diego County Fair Oratorical Contest every year since 2010. 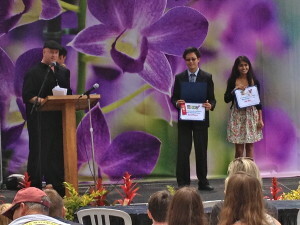 Academy for Public Speaking graduates frequently win top honors in each age division. Congratulations to Austin Zhang for winning 2nd place in the high school division and Miles Blue for winning 3rd place in the middle school division! Congratulations also to all of the Academy for Public Speaking students who competed in their first speech contest at the San Diego County Fair. We are very proud of you! 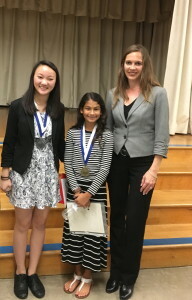 Academy for Public Speaking graduates competed in the 2014 Del Mar Solana Beach Optimist Club’s speech contest and won top honors! Due to a record number of 29 contestants, the girls competed in the morning and the boys competed in the afternoon. The topic for this year’s speech contest was How My Passions Impact the World. The students presented 4-5 minute inspirational speeches. Academy for Public Speaking graduates Priya Garcia won 1st place & $150 and Solana Garcia won 2nd place & $100 in the contest for girls. Academy for Public Speaking graduates won 1st & 3rd place in the speech contest for boys. Hanrui Zhang won 1st place & $150 and Austin Zhang won 3rd place & $50. The first place winners of the club level oratorical contests will advance to the zone level of the contest. The winners of the zone contest will advance to the 3rd and final level of the contest, which is the district contest. The top prize is a $2,500 scholarship. Best of luck, Priya & Hanrui! Five Academy for Public Speaking graduates competed in the 2014 Encinitas Lions Club Speech Contest. This year the students shared speeches on the topic Community Service – What it Means and Why it Matters. 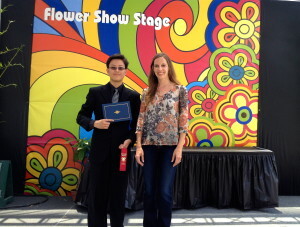 Congratulations to Academy for Public Speaking graduate Hanrui Zhang for winning 1st place! 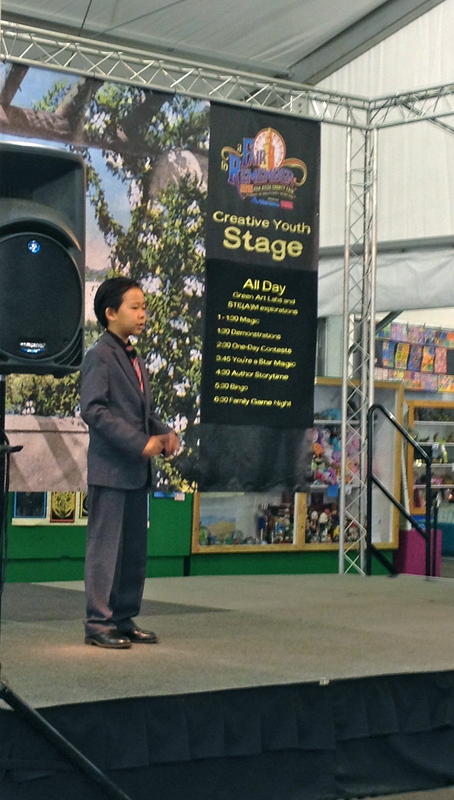 Academy for Public Speaking graduates also competed in the 2013 San Diego County Fair Oratorical Contest. At the fair, students compete in the elementary, middle, or high school division. Academy for Public Speaking graduates won 3rd place & $150 in all of the divisions and 2nd place & $225 in the high school division. Academy for Public Speaking graduates won $150 and 3rd place in all three divisions at the 2013 San Diego County Fair Speech Contest. Miles Blue won in the elementary division, Navarro Peck won in the middle school division, and Aisiri Murulidhar won in the high school division. Academy for Public Speaking graduate Austin Zhang won 2nd place and $225 in the high school division. With 20 contestants in each division, the Academy winners should be very proud of themselves! 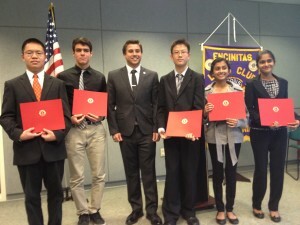 Academy for Public Speaking graduates, Hanrui Zhang, Austin Zhang, Megha Sanjiv, and Aisiri Murulidhar competed in the 2013 Encinitas Lions Club Speech Contest. Each student had up to 10 minutes to present a speech on the topic How to Create and Keep Jobs in America. Congratulations to Austin Zhang for winning 1st place! 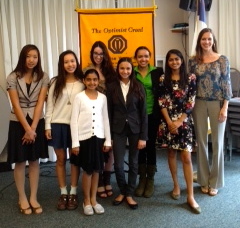 Seven Academy for Public Speaking graduates competed in the 2013 Del Mar Solana Beach Optimist Club’s Speech Contest. The topic this year was Why My Voice is Important. Each student presented a 4-5 minute speech. Congratulations to Aisiri Murulidhar for winning 1st place and Daniel Kalotov and Christin Lacey for winning 2nd place! Aisiri Murulidhar Wins 1st Place! 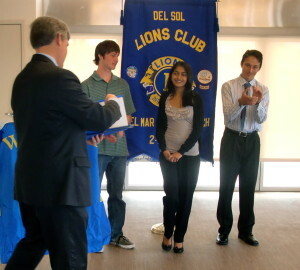 Academy for Public Speaking graduate Aisiri Murulidhar competed in the 2012 Del Sol Lions Club Oratorical Contest. The topic this year was “Why My Voice is Important.” Each contestant presented a speech up to 10 minutes. Congratulations to Aisiri for presenting an extremely thought provoking speech, using her voice to make a positive difference in our world, and winning 1st place! San Diego teenagers are becoming confident, effective communicators as they learn confidence, public speaking, and leadership skills by participating in the Academy for Public Speaking courses developed by Distinguished Toastmaster & Credentialed Teacher Kathleen Petrone. The three students pictured below began their first 8 week course in February 2011. Just 2 months later, they were competing and winning cash prizes in local speech competitions! Academy for Public Speaking graduates Hanrui, Austin, & Kevin won 1st, 2nd & 3rd place, respectively, in the Del Mar Solana Beach Optimist Club’s Speech Contest on April 2, 2011. Hanrui competed at the Zone Level in April and advanced to the final level of the competition in May. Hanrui won 3rd place at the San Diego District Level. Hanrui, Austin, and Kevin will graduate from the Academy for Public Speaking Advanced Course in June. Can middle school and high school students use their voices to make a difference in our world? Absolutely! In this uplifting news article, find out how the Academy for Public Speaking students use their public speaking skills to promote philanthropy by creating awareness and winning donations for their favorite charitable organizations. This article was published in the January 20, 2011 editions of the Carmel Valley News and the Del Mar Times. Read about the January 2011 Academy for Public Speaking graduates, find out who won the Persuasive Charity Speech contest, and learn which charity received a donation from the Academy for Public Speaking (formerly Teen Speaking Skills) in the February 10, 2011 editions of the Carmel Valley News, the Del Mar Times, and the Solana Beach Sun. Click on the blue links to read any of the articles mentioned above. The following article was published in the October 22, 2010 edition of the Carmel Valley News. After completing an eight week Youth Leadership Program in Carmel Valley during August and September, the teenagers who took the public speaking skills classes are not only communicating more effectively, but they have also gained more confidence in their speaking and leadership abilities. Although the majority of the students began the course feeling uncertain and inhibited, those initial fears quickly dissipated as the teens became actively engaged during the highly interactive sessions. The course participants celebrated their achievements during a final showcase event held on Friday, October 15th at Pat & Oscar’s in Carmel Valley. For their final project the students presented persuasive charity speeches to recommend which charity should receive a $50 donation from the course instructors Kathleen Petrone and Jimmy Thai. The philanthropic focus was selected to help the students overcome any nervous feelings by focusing on the importance of their cause and conveying their message to the audience. Congratulations to Josh for winning the speech contest and earning a $50 donation for the World Wildlife Fund! The eight week Youth Leadership Program was developed by Toastmasters International and is run by local Toastmasters who donate their time and talent to teach public speaking skills to students. Jimmy Thai is an accomplished, award winning Toastmaster who competed in the World Championship of Public Speaking at the 2010 Toastmasters International Convention. In addition to being to a Toastmasters Area Governor and the President of Hi Fi Speakers Toastmasters in Carmel Valley, Kathleen created Teen Speaking Skills to provide another program for teenagers who want to further develop and refine their public speaking skills. The mission of Teen Speaking Skills is creating confident communicators. Confidence is the key to helping teenagers communicate effectively and achieve their goals and dreams. The next Teen Speaking Skills class is scheduled to begin on Saturday, November 6, 2010. For additional information, visit www.TeenSpeakingSkills.com.